Although my own health didn't allow me to enter the competition in 2015 I did respond to two pieces. 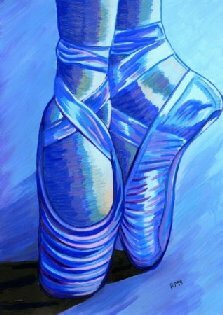 Blue Ballet Slippers, by mouth painting artist Rosie Moriarty Simmonds inspired my poem Tomorrow’s Dancers, which I included in my pamphlet, Dressing Up, and in an article for Poetry Wales issue 52.1, on Poetry and Disability. 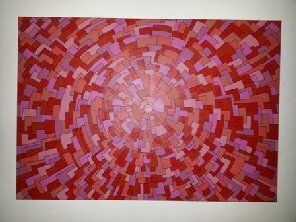 Study in Red by Lucy Chaplin inspired my poem of the same name and you can read my poem of Study in Red in the magazine Corncrake; that poem is one of very few where I actually use my diabetic complications, blindness and kidney failure, in a poem. I enjoyed writing poetry about visual images so much that I bought framed prints of both of those paintings. In 2016 the theme was austerity and extravagance. The two pieces I chose to respond to were Dressing Up, Dressing Down by Gemma Paine and A Tree in Two Movements by Rose Foran. My pamphlet had a poem called Dressing Up and another called Dressing Down already in the early drafts, so it seemed a perfect fit. I responded with a poem titled Glad Rags and it too is contained in the pamphlet. The painting A Tree in Two Movements touched me with its title. I love classical music and Franz Schubert’s symphony no.8 in B minor is known as The Unfinished because it only has two movements where a symphony in those days more normally had four. I turned the tree into a Christmas tree and the two movements as two very different settings. My poem adds the word unfinished to Rose’s title and uses the tempo markings from the Schubert symphony as stanza headings. When the results were announced this poem was highly commended. In 2017 I once again found the musical connection chiming a chord and it was again the artwork of Rosie Moriarty Simmonds that did the trick. A sighted friend described her painting as being like the chalk outline of a human figure which, to me, conjured an image of a person whose presence I was aware of but couldn't quite touch. Word Ward is a creative writing group in Cardiff for anyone with a long term health condition. A relaxed space where people can meet and share their passion for creative writing. We meet every other Wednesday evening in a fully accessible room in the Wales Millennium Centre. Rosie Moriarty Simmonds, The mouth painting artist who has inspired two of my poems, is also in the news this week for being one of the 100 women: A celebration of Wales' brilliant women for the enormous amount of charity work she does and her work raising awareness on disability matters. I do like the Unfinished Story of a Tree in Two Movements! I think the stand in angel should have a hyphen though. I got stuck there, and it strikes me that’s something you might not be so aware of, because of not seeing it. A stand-in angel reads right because of the hyphen creating the compound adjective ‘stand-in’. A stand in angel (without the hyphen and three separate words) makes me think it might be a stand (like a hat stand) or an error because you meant ‘standing angel’. I also love the eyebrow-raising effect of a blind person responding to a piece of visual artwork. Delicious.